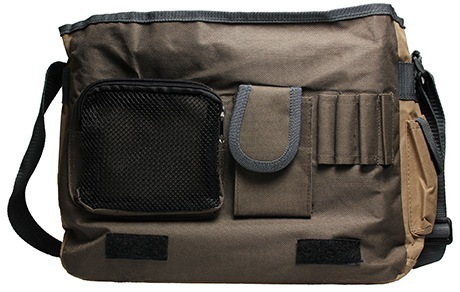 Transport your game night gear in style with this durable nylon messenger bag! Big enough for your Core Rulebook and other campaign essential books, along with dice, notes, and pencil holders, these messenger bags debuted at GenCon 2013 and are only available in limited quantities! Interior Dimensions: 14-1/2" x 9" x 3-1/2"
Strap length: 27" to 46"
I bought this for my wife, who is a gamer girl, who loves to carry all her stuff around with her in case of boredom. She also love bags. She had been searching for a complete bag- one to hold her DnD stuff, 3DS, game bag, pens, notebook, etc etc and this is beyond perfect. She absolutely loves this bag and all of the space it has. Happy wife, happy DnD sessions LOL. 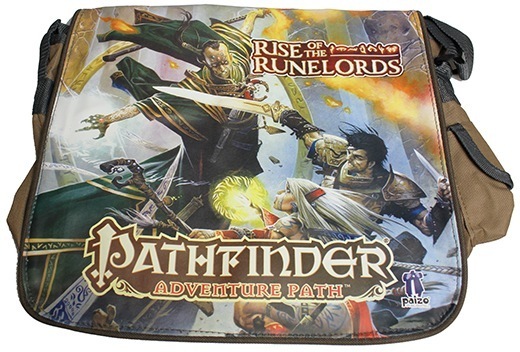 Sign in to start a discussion about Pathfinder Adventure Path: Rise of the Runelords Messenger Bag!